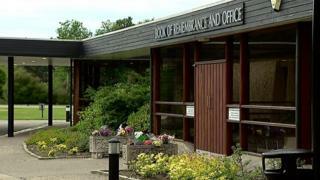 A report into the baby ashes scandal at an Aberdeen crematorium includes a claim staff misled the senior judge who was investigating procedures there. Aberdeen City Council was ordered by the information commissioner to release the secret report after a request from BBC Scotland. It was commissioned after the revelation that babies were being cremated with unrelated adults. The council said Hazlehead Crematorium operations had been transformed. This report is one of many into what happened at the council-run crematorium where babies and adults were often cremated together, with ashes returned to the relatives of adults. The parents of babies were told no ashes were recovered. The council previously refused to release the report, but has now been forced to do so, although it is heavily redacted. The report said that following the decision by the City of Edinburgh Council to commission Dame Elish to lead the investigation into procedures surrounding the disposal of baby ashes at Mortonhall Crematorium, there were discussions about the implications for Hazlehead. The view was that there were "no implications as the focus of media attention had been about what had been done with recovered ashes, and that the conventional wisdom was that no ashes were recovered at Hazlehead because of the high temperatures and performance of the new cremators". The report, by independent investigator Richard Penn, claims former senior judge Lord Bonomy was misled by those Aberdeen City Council staff he met when he and his team visited the crematorium as part of his inquiry. Paul Wells, who lost his son Scott to cot death and did not receive any ashes, told BBC Scotland: "It's very hard, it's devastating to keep going through it all. "There is still so much blacked out (in the redacted report), it still leaves so many questions unanswered. "I don't think we'll ever really get closure." He added: "Changes have happened, it's a lot more policed than it was before." Council co-leader Jenny Laing said: "We have taken action. "I feel we have done everything in our power (to ensure) that the practices will never be repeated again." An anonymous letter by a former member of staff was sent to the council in May 2014. It said staff were "trained in a procedure that we thought to be correct", and said there were never any remains recovered from children who were less than two years old. "They were never cremated on their own, they always went into the cremator with an adult," the letter said. "I am appalled that I myself have been part of this and think the responsibility lies with Aberdeen City Council for allowing this to happen." The interim chief executive shared the letter with Lord Bonomy, chairman of the Infant Cremation Commission, as the allegation cast doubt on the reliability of the evidence provided by the council to the commission. The crematorium superintendent Derek Snow confirmed that there could be some truth in the letter. Neil Carnegie, a senior service manager for housing management, was asked to carry out an internal investigation into whether staff had been truthful to Lord Bonomy about processes, and whether they had withheld information they were required to disclose about the cremation of babies with adults. Mr Carnegie told the National Cremation Investigation: 'I am satisfied that there was malpractice in terms of they were putting more than one coffin in at the same time as well. "In terms of exactly what was happening, I am still not sure. There was malpractice. I think it would have been a fairly regular routine arrangement but I was told different versions of events." Mr Snow was sacked on 28 June 2014. The report said the review of Aberdeen City Council's cremation practices by PwC had "clearly not been given the correct information about the processes in place at Aberdeen Crematorium". It also said it was "clear that Lord Bonomy had been misled by those Aberdeen City Council staff who met with him and his team during the Infant Cremation Commission's visit to Aberdeen Crematorium". Image caption Dame Elish Angiolini's report into the scandal described practices as "abhorrent"
The report also found there was "no evidence that any effort had been made by any of the senior managers concerned at Aberdeen City Council to clarify at exactly what age or stage ashes are available". It said senior managers did not challenge what they were told by the crematorium manager despite the information and evidence that emerged from the Mortonhall Crematorium initial investigation. Environmental manager Steven Shaw said it was not until he watched the BBC documentary Scotland's Lost Babies in 2013, which included revelations that Edinburgh's Seafield Crematorium recovered ashes and returned them to parents, that he started to question practices at Hazlehead. "I was a bit surprised and a bit horrified because we had always stuck by our statement of no remains," he said. An Aberdeen City Council spokesman said: "Over the past few years, operations at the crematorium have been transformed and there is now an open and inclusive ethos where staff are encouraged to contribute and challenge. "Every crematorium staff member is a qualified cremator technician certified to carry out infant and baby cremations. "At the inspection of Hazlehead Crematorium in 2016, the Inspector of Crematoria Scotland noted the Crematorium Operational Procedure document as a credit to the authors and one of the most comprehensive and useful guidance and training aids seen by the inspector at any of the other 28 crematoria in Scotland." The spokesman added: "Those improvements do not in any way compensate for the pain suffered by those affected by past practices but are an indication of the comprehensive measures taken to address the issues identified." The council said the commissioner decided that the council "correctly withheld" some of the information contained in the report. It said the redacted sections primarily related to personal data which is not otherwise publicly available.